I can’t believe that it’s already 2017. Because of how grueling chemotherapy has been these past 6 months, I honestly never thought I’d make it to the new year. But, thanks be, I did it. I survived 6 months of terrible, horrible, no good, very bad endless days, and endless nights of fear, anxiety and pain. All FINALLY done and over with. Which means no more weekly rounds of chemotherapy drugs, no more pills to help me sleep, or eat, or control the nausea and pain. No more hospital stays. NO MORE CHEMOTHERAPY. Because as of right now, I am CANCER FREE! And though I’ll be starting a drug that blocks all estrogen growth within my body, in the hopes to stop the reemergence of my cancer, I am FINALLY back to being me. Back to being independent. Back to living. I can honestly say that although I was NOT a very good cancer patient, and struggled desperately with mind numbing depression and anxiety, two things became very clear to me within this past half year. Firstly, I am nothing without my family. My Mom, my Dad, my Mother & Father-in-law, my sisters, my husband, my daughter. No one else saw or understood the many (horrible) things that I endured. My family, who out of everyone else within my small circle of family & friends, were truly & fully there for me, every step of the way through it. Without them, I doubt I would have made it through. Secondly, I pray that I will never take for granted any of my own independence, ever again. For 6 months, I wasn’t able to drive, or clean, or cook, or be with my own furry kids (my dog & 3 cats, who remained at my own house while my husband, daughter and I lived with my Mother). In nearly every way possible, I lost all tangible forms of independence. Which was horrible. Truly horrible. Something which I am totally ecstatic to have back. Like you wouldn’t believe. So to celebrate being back in my own little house this week, surrounded by my 3 furry kids, I was super excited about throwing together this new slow cooker Minestrone Soup recipe! Specifically for my husband, as a small thank you for everything he endured last year. Because what says love more than a lovely bowlful of warm, homemade soup? Not much else. Firstly, slice, dice and cube the potatoes, carrots, celery and onion. Cook the cubed potatoes, and the seashell pasta, in separate pots, until just fully cooked through. Drain each pot and set each ingredient aside. Set your slow cooker to high, for 2 to 3 hours, and add in the can of diced tomatoes, tomato sauce, vegetable broth, kidney beans, green beans, carrots, celery and onion. Stir together until well mixed. Sprinkle in salt and pepper. Now add in the potatoes and seashell pasta. Let all of the ingredients cook together for the full 2 to 3 hours. Spoon out into desired serving bowls and garnish with a handful of parmesan cheese! And enjoy! This wonderful vegetable soup may soon become one of your favorite winter soups, too! Happiness Project#49: In-A-Pinch Chicken Chili! Chili. My husband is the KING of all things chili! Both sides of our Family request his chili dish, whenever the weather starts to bring in some chill, without fail. But since I’m the one cooking dinner dishes, more often than not now, I decided that it was high time to create my own kind of chili bliss. Nothing like my husband’s traditional dish, either. There’s no way that I would ever want to mess with such a tantalizing culinary masterpiece! That’s how good his chili is! But here’s the thing, good chili recipes tend to have A LOT of ingredients. Like an entire grocery cart full of ingredients. Which is NOT good for my weekly grocery budget. Unless I’m willing to sacrifice my favorite granola cereal or favorite apple or worst yet, coffee. Needless to say, the thought of going coffee-less (even for a day) leaves me close to tears. So no, NO chili then. You’ll be multi-tasking for this one, so get ready! In a medium sized pot, with about 2 cups of water, over medium-high heat, drop in two pinches of kosher salt, followed by the 3 thawed chicken breasts. Let cook until the chicken is nearly cooked through. Drop the heat to low and add in the two whole bay leaves. Let cook for another 5 or so minutes. While the chicken is cooking, place a large skillet over medium heat and add in the 3 cups chicken broth, bullion cubes, onion, oregano, cumin, chili powder and ranch dressing. Let slowly incorporate for 8-10 minutes. Once the chicken is fully cooked, drain and let stand at room temperature for a few minutes before you shred each chicken breast into long pieces. Now the pretty part! 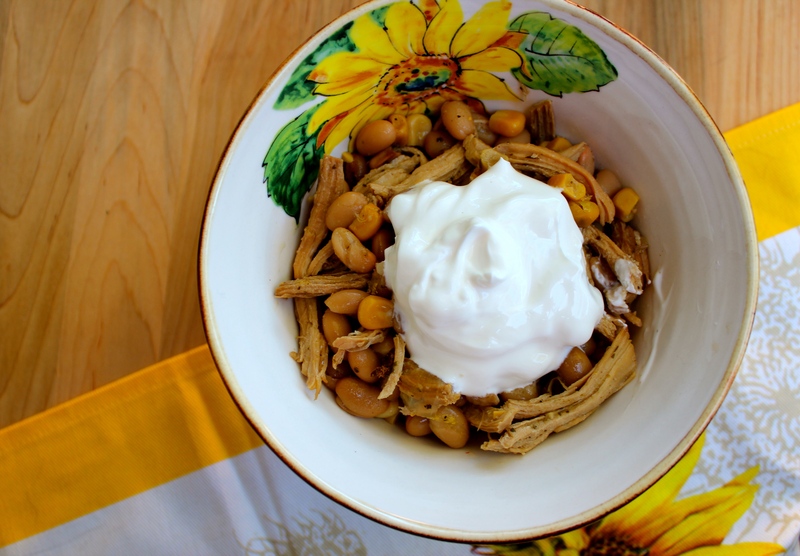 Plug in your slow cooker machine, set on high, and pour in both cans of the beans and corn. Then add in the shredded chicken (which will smell ridiculously fragrant, indeed). Followed by the entire skillet full of the mixed broth and spices. Let sit in the slow cooker for 30 minutes before stirring up all of that lovely chicken chili together! And serve! With a dollop of sour cream, for an added bit of creaminess!